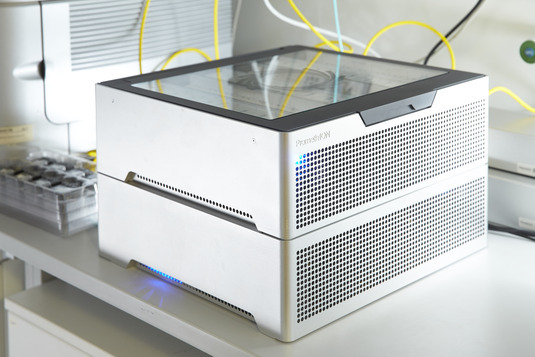 The group of Helmut Blum has established an integrated platform for biomedical research using the technologies of Illumina and Oxford Nanopore. Massive multi-parallel sequencing enables the analyses of genomes, transcriptomes and exomes for demanding scientific questions. We provide expertise in strategic conception of sequencing projects and develop customized methods for sample processing, sequencing library construction and quality control. We perform high throughput sequencing and sophisticated bioinformatics including data handling, customized analyses, evaluation and visualization of sequencing data. We host robust next generation sequencing systems from Illumina. A variety of (multiplexed) assays is established, e.g. : RNA seq, DNA seq, Exome Seq for intact and low quality DNA and targeted resequencing. 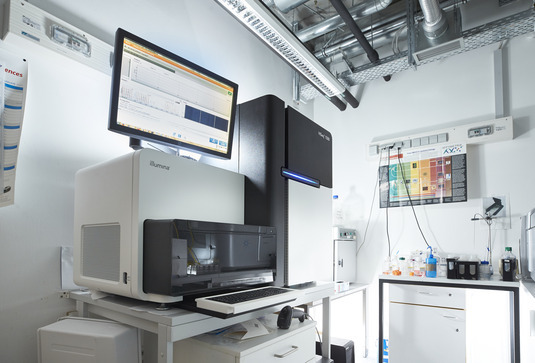 The Illumina HiSeq1500 sequencer ensures high data quality using the sequencing by synthesis chemistry. The system is very robust and features two run modes: a rapid-run mode (up to 125 GB on two lanes, each up to 150 mio clusters, maximum reading length of 250 b) and an high-output run mode (up to 1 TB of data on eight lanes, each up to 200 mio clusters, maximum reading length 125 b). Multiplexed samples can be run without barcode bleeding. The novel nanopore-based sequencing technology requires minimal or no manipulation of natural DNA/RNA molecules. The Oxford Nanopore sequencing technology uses an ionic current, which passes through nanopores. Changes in this current during translocation of biological molecules are measured and can be used for its identification. We power pocket-sized, portable MinIONs. These sequencers have up to 512 nanopore channels and are capable of producing up to several million reads with length that can exceed 100 kb. Additionally, we host the PromethION, a large-scale benchtop sequencer, that can run up to 48 flow cells of 3000 nanopore channels each. In this system flow cells can be loaded individually or in batches. Miniaturization and Automation are essential to enable cost effective small as well as medium scale sequencing projects. This technology is indispensable for large-scale projects like our Munich MIDY pig Biobank project with several thousand of tissue samples. It further provides benefits like lower costs, increased reproducibility, reliability and throughput. We use a Mantis liquid handling system, a fast contact free dispensing system for sub-microliter volumes to establish protocols in for 96- or 384-plates. The Mantis is capable of dispensing as little as 0,1 µl and thus reduces reaction volumes, costs for reagents and reduces manual handling time. Adequate powerful software and hardware platforms are crucial requirements for the analysis of NGS data. We set up a Galaxy analysis framework, that is continuously adapted to the latest state by integration of newly published procedures. This user friendly platform was developed by the Penn State and Emory University (Giardine et al., 2005) and allows analysis of sequencing data for both experts and users without specific bioinformatics skills. Thus users do not need prior knowledge of command-line based programming or of widely used R-based procedures to evaluate sequencing data. Analysis can be simply performed by combining procedures to tailored workflows. These can easily be automated while users are still able to modify parameter settings. A user management system provides members of the scientific computing network of the Leibniz-Rechenzentrum (LRZ) in Munich with access to Galaxy via a graphical web interface. The performance and technical capability needed for data analysis is provided by our sophisticated cooperative data processing infrastructure. It comprises dedicated fileservers, core head nodes and compute nodes. Dedicated fileservers handle input data from Illumina or Oxford Nanopore sequencing. Core head nodes host the Galaxy system or perform preprocessing of sequencing data or metagenomic analyses. Project head nodes are constructed to fit the requirement of large research projects. LRZ archives are used for long-term storage of NGS data.